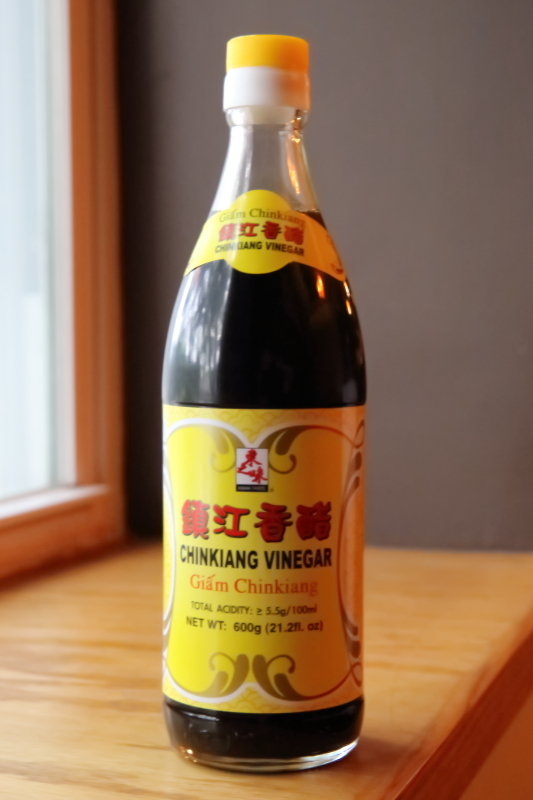 Here is a collection of the items that I think of as my staples for the Chinese pantry. They are used in many of the recipes in this blog. Different cooks will have different opinions as to the essentials, which of course is right and proper. I invite comments. Let me know what you think. Note: This post will be updated, so if you find it useful or interesting, please check back from time time to time. Any updates will be noted here in this header so you can easily tell if anything has changed. You are currently reading the third version, posted 2/20/2014. One important thing about Chinese sauces and condiments: there isn’t any national or cultural standardization. Contrast that with Western condiments like mustard or ketchup, which are pretty much the same everywhere unless you start getting into artisanal preparations. But in China, even with something as ubiquitous as spicy bean paste (辣豆瓣酱, là dòubàn jiàng), you’ll find many different variations throughout China. So when you’re following a recipe, don’t worry too much about getting exactly the right preparation. Instead, try several varieties that interest you, note how they taste, decide what you like, and go with that. First, let’s talk about soy sauce. There are three main varieties in Chinese cooking: light, dark, and flavored. The “light” soy sauce doesn’t imply less sodium; instead, it’s soy sauce with a crisper flavor and a relatively light color. Most of the common soy sauces available in Western grocery stores are similar to Chinese light soy sauce. Dark soy sauce, on the other hand, is usually available only in Chinese markets. The flavor is much deeper and the color is richer. One Chinese cooking aphorism says that “light soy sauce is used for flavor, while dark soy sauce adds color.” It’s true that dark soy sauce adds a very striking dark color to dishes, but its flavor shouldn’t be sold short. It has a nice, deep umami taste. The last category is flavored soy sauces, with the most common flavor being mushroom. The flavored sauces can be substituted for dark soy sauce, with the flavor adding more richness. Next in my essential pantry is spicy bean paste (辣豆瓣酱, là dòubàn jiàng). Translation can be a bit difficult, as you can see in the picture above. Lee Kum Kee renders dòubàn jiàng as “Toban Dian,” while they translate the Chinese as “chili bean sauce.” If you’re not familiar with this product and are going to a Chinese market, print this out and show it to your shopkeeper: 辣豆瓣酱. In any event, it’s a versatile paste made of mashed beans, oil, and spicy peppers. There are many different versions of spicy bean paste, so don’t be intimidated if your Chinese market has six or seven different varieties to choose from, none of which looking anything like the others. Some are oily, some aren’t; some are thick, some are more liquid. Just be adventurous and try one that looks good. Then try another one when your first bottle runs out. Shaoxing glutenous rice wine is another staple. It’s used at the beginning of meals as a marinade to tenderize and flavor meats, and it’s used in the final steps of cooking to add flavor to the final sauce. As with all cooking wines, it’s best to use one that you’d be comfortable drinking, however some varieties are deliberately rendered undrinkable through the addition of lots of salt. So pay attention to whether you’re buying a salted or unsalted wine. Regardless, the cooking wines will have an alcohol content between 12% and 16%. The alcohol boils off if used at the beginning of the cooking process. If you don’t have Shaoxing wine, you can substitute dry sherry or even gin. After hearing that the company is constructing the “aircraft carrier of chili processing industry”, how could you not want to try it? Chili oil doesn’t need much of a description. It isn’t used as a base for stir-frying, but instead is used later in the cooking process to impart flavor and heat. Sesame oil is ubiquitous enough that it’s available in many Western markets. Like chili oil, it’s not used as a basis for frying, but instead is used later for flavor. It has a rich umami and smoky taste. A little goes a long way… if you’re in doubt about how much to use, start with a small amount, taste, and then adjust. Most dishes need no more than 1 tsp maximum. Dried chiles are the next staple. These will keep forever in your pantry so you can buy any size bag you like. They should be dry enough that you can snap or cut them into small pieces, but not so dry that they crumble into tiny pieces or powder. The seeds can be very hot so feel free to discard the seeds after breaking up the peppers. Star anise has a pleasant licorice flavor. Sold dried, it will keep for a long time. These are commonly used in northern Chinese braises and boils. Sichuan peppercorns are simply amazing. They have a citrusy flavor and they produce a kind of numbing sensation in the mouth, so that the mouth feels tingly as if you’ve just had a tiny bit of novocaine. (Don’t worry, it’s much more pleasant that that sounds). The numbing effect of these peppers is combined with spicy chiles to produce the famous “numbing and spicy” taste (麻辣, málà) that is cherished in Sichuan cuisine. Cinnamon is common both in Asia and in the West. In China, the specific variety is often Cinnamomum cassia, also called Chinese cinnamon, also called cassia bark. The raw bark may appear coarser and rougher than traditional Western cinnamon sticks, although the taste is similar. It’s also handy to keep dried black mushrooms (also known in Japanese as shiitake) on hand. When you have the opportunity to use fresh mushrooms, I’d encourage you to do so, but the dried versions are so good that it makes sense to keep some in your pantry. To reconstitute dried mushrooms, soak them in hot water for 30 minutes, and then press dry. The soaking water turns into a beautifully fish broth that’s worth using or saving, which is another reason to keep the dried mushrooms on hand. Tianjin Preserved Vegetable ( 天津冬菜, Tiānjīn dōngcài), also called preserved “winter vegetable,” is cabbage that has been pickled with salt and garlic. It doesn’t have a strong flavor on its own, but it adds a rich umami depth to any dish. You can use it as a salt substitute, or you can sometimes use it in place of soy sauce since the flavors are different but the salt content is similar. It keeps forever. That concludes my list of things that are essential for the Chinese pantry. Everything above will keep a good long while and is versatile enough to appear in many recipes in this blog. Enjoy, and please leave comments and suggestions. This entry was posted in Uncategorized and tagged Asia, Asian food, China, chinese food, essential Chinese pantry, essential pantry. Bookmark the permalink.